Some of the most popular characters in science fiction are its artificial creatures: the robots like R2D2, the androids like Commander Data. I like them too, especially Data, but there’s another type of artificial creature I find more interesting. Or I should say semi-artificial, because I’m talking about cyborgs – cybernetic organisms: half living organic beings, half cold, dead steel, plastic, and computer chips. What is intriguing about cyborgs is the tension between the two halves. In the 1987 film RoboCop, the level of crime in Detroit requires a new kind of policing. Enter RoboCop, a metal body with super physical capabilities that’s given intelligence and personality by an implanted brain from a dead policeman. RoboCop is an outstanding law officer, but inside that casing is a mind that yearns for the warm human connections it once had but can never recover. Even more interesting is how far we’ve come toward making brain-machine interfaces and even a real cyborg. In 2000, to study how the brain controls movement, Sandro Mussa-Ivaldi at Northwestern University installed a fish brain in a nutrient bath aboard a motorized wheeled cart. Electrodes placed in the brain took input from light sensors on the cart and sent output to the motors. Depending on where the electrodes were placed in the brain, the cart would move toward or away from a light source. While less exciting than RoboCop, this truly demonstrated a living brain controlling an artificial body. 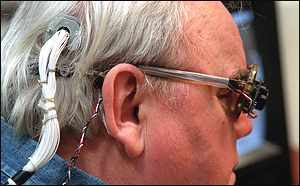 Other examples of brain–machine interfaces come mostly in the form of neural implants for medical use. The best known is the cochlear implant, which restores hearing to deaf people. The cochlea is a small spiral structure in the inner ear. It houses the auditory nerves that pick up sound vibrations and turns them into nerve impulses that go to the brain. The interface includes an external microphone mounted behind the ear, which converts sounds into electrical impulses that travel along wires implanted in the cochlea. This activates the auditory nerves and creates the sensation of sound in the brain. In the United States, about 37,000 of these implants have been installed in adults and children. Another application for neural interfaces is in artificial limbs that can be controlled by thought alone. This research began around 2000 and has received a huge boost because of the U.S. military involvement in Iraq and Afghanistan, where body armor increases the survival rate of soldiers but doesn’t always protect their limbs. The result is about 1,200 amputees among U.S. casualties to date. To deal with this, the Defense Advanced Research Projects Agency (DARPA) of the Department of Defense is sponsoring crash programs in prosthetic research. These have produced prototype prosthetic arms with neural interfaces, now being tested. DARPA also sponsors other research in neural interfaces with direct applications to fighting wars. One area that hasn’t developed as far as people would like is neural interfaces to restore vision to the blind and near-blind – a group that includes millions in the United States. This has lagged because the visual system is so complex. Each eye contains more than 100 million rods and cones, and it takes about 30% of the brain to interpret the incoming visual data whereas auditory data needs only 3%. Still, researchers have shown some success using interfaces to the brain and also to the retina. At least one commercial retinal device is now up for FDA approval. But the device’s low visual resolution and projected $100,000 price tag show that there’s still a long way to go. Fictional artificial creatures can be compelling characters – terrifying, amusing, or thought provoking. Real-life cyborgs are less dramatic but have a different fascination. They’re an important part of the future in medicine, in warfare, and maybe in areas we have not yet imagined. For more about cyborgs and other artificial creatures, read Sidney Perkowitz’s book Digital People.